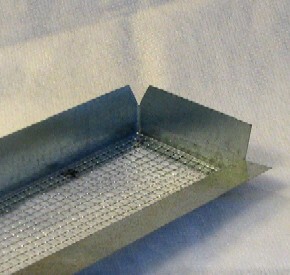 PRODUCT: 22.25" x 5.50" EAVE / SOFFIT VENT WITH INSIDE NAILING FLANGE. 26 GA. GALVANIZED STEEL. PRICE/EACH. * Designed to be mounted in-between standard 24" spaced 2x6 rafters / trusses, for insertion and nailing from the inside. * Die formed and spot welded for best strength and appearance. * All galvanized steel construction. 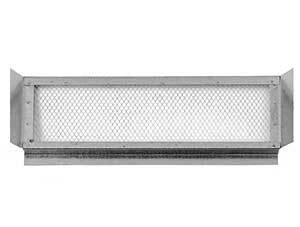 * Louvers are backed with 1/4" mesh hardware cloth. * Approx. 78 sq.in. net free air. * 1-1/2" nailing flange at each end. 22.25 in. x 5.50 in. EAVE / SOFFIT VENT, UNIVERSAL / PAN STYLE DESIGNED TO FIT INSIDE 2X6 TRUSSES. 26 GA. GALV. PRICE/EACH. 22.25 in. x 5.50 in. RETROFIT EAVE VENT WITH OUTSIDE NAILING FLANGE (designed for insertion and nailing from the OUTSIDE). 26 GA. GALV. PRICE/EACH.